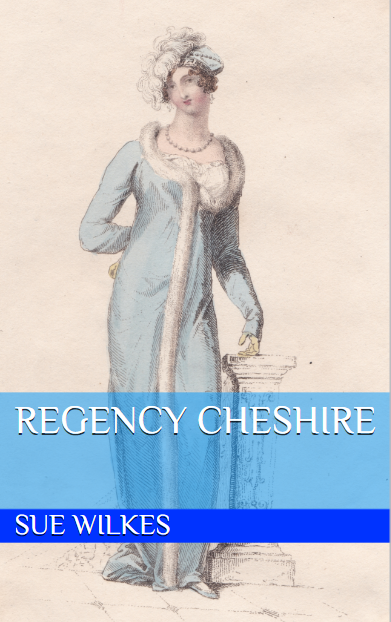 We are thrilled to welcome back the author of Regency Cheshire, Sue Wilkes who explores the county during the age of Jane Austen and Walter Scott; Regency Cheshire is now available on Kindle. Here’s a brief look at one of Cheshire’s most famous Regency-era architects. Thomas Harrison (1744–1829), a Yorkshireman of humble origin, learnt his craft in Italy during the early 1770s. Harrison’s works brought a restrained classicism to the city. His first major project was the Castle site, home to the civil and crown courts, county gaol, and an army garrison. Prison reformer John Howard, who visited in 1788, likened conditions in the cells (which housed debtors and felons) to the Black Hole of Calcutta. Harrison’s Chester Castle works. The Propylea Gate is on the very far left. The county gaol, jury rooms and prothonotary’s office are in the building on the left. The Shire Hall with its Doric columns is to the right. The east wing (left) of the Hall was the military barracks; the west wing was the armoury. In the summer of 1784, Cheshire magistrates, following a country-wide typhus epidemic the previous year, held a design competition for a new gaol within the castle. Thomas Harrison, now in his early forties, won the 50-guinea prize for his plans. Preliminary work began on site in 1788. Although Harrison’s design was very beautiful, it wasn’t necessarily secure; five prisoners escaped in the spring of 1802, and another five absconded in November 1807. Harrison’s beautiful Propylaea Gateway, inspired by the Acropolis in Athens, was the crowning glory of the Castle complex. The gateway, with its Doric porticos and massy columns, is a high point of Greek Revival architecture in England. 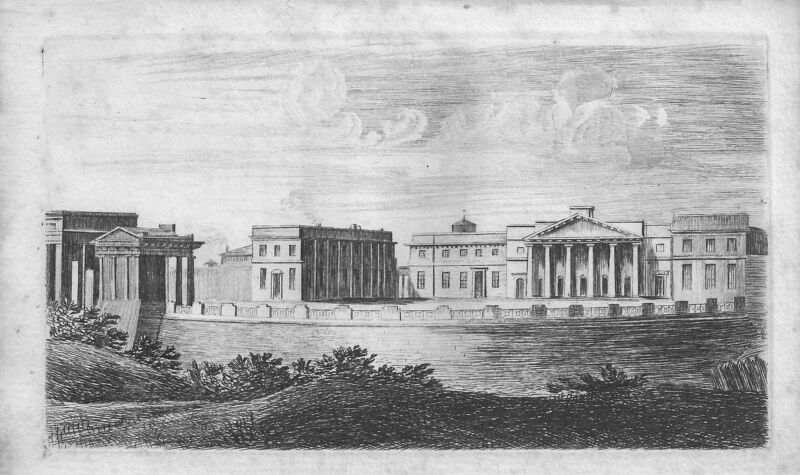 Harrison’s new Shire Hall, with a grand façade of a Doric portico in fine ashlar stone, formed a harmonious whole with the prison buildings. Work continued on the Castle site for the rest of the decade; a new Armoury and Barracks (the present day Regimental Museum) for the garrison was added. Harrison was also asked to revamp the city’s last surviving medieval gate, the Northgate. It housed the city gaol and had a dire reputation. This mouldering pile had a dreadful dungeon thirty feet below street level. The Northgate was demolished and replaced by Harrison with a ’light, elegant structure of white stone.’ He also designed a new city gaol and House of Correction, built between 1806 and 1808, close to the medieval walls, but these buildings no longer survive. Harrison was a very busy man in Chester during the Regency era. Thomas repaired the crumbling fabric of Chester Cathedral and refurbished the Exchange. His elegant Commercial News Room on Northgate St was a quiet haven for gentlemen wishing to peruse the daily newspapers. At Chester’s famous racecourse, the Roodee, he designed the first permanent grandstand to give genteel race-goers some protection from the weather. His skills were also greatly in demand for private homes. Sue Wilkes is the author of several history and family history books. A Visitor’s Guide to Jane Austen’s England explores life in Austen’s day. Regency Cheshire is out now on Kindle, and her latest family history book, Tracing Your Manchester and Salford Ancestors, is available from Pen and Sword. She blogs at Sue Wilkes and A Visitor’s Guide to Jane Austen’s England.